Throngs of women determined to push back against the new American president descended on the nation's capital and other cities around the globe Saturday for marches aimed at showing Donald Trump they won't be silent over the next four years. They came wearing bright pink "pussyhats" and wielding signs with messages such as "Women won't back down" and "Less fear more love." A Phoenix march was also scheduled from 10 a.m. to 2 p.m. at the state capitol. 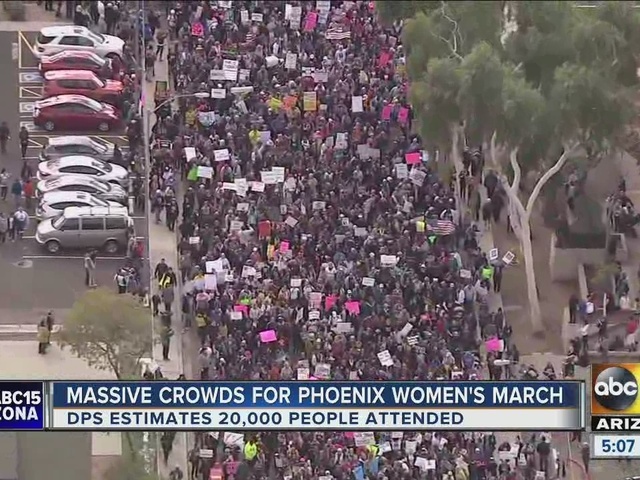 The Department of Public Safety told ABC15 about 20,000 people were participating in the march as of noon. Women, men, children -- people of all ages -- crowded around the Arizona State Capitol before marching through the streets to send a message. They held signs and chanted, passionate about the direction of the country. “I’m really worried about where our country is headed. 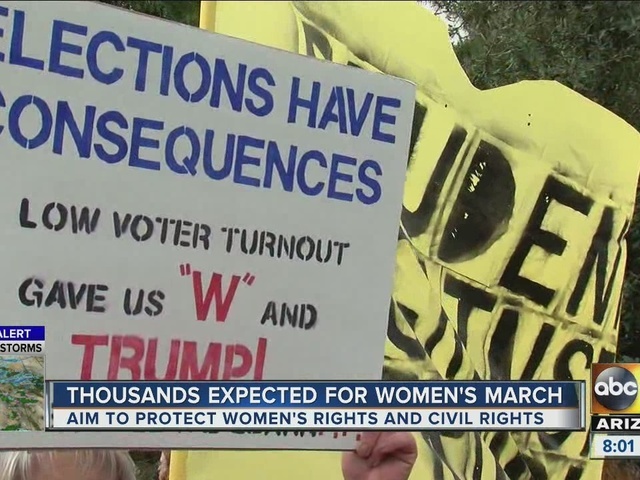 I think we’re headed for some really scary times," said Susan Jacobs, who attended the march. Many families said it was important to bring their little ones with them, as well. “I’m only 10 years old. I know how to treat girls. Why doesn’t he (President Donald Trump) know how," said Luke, reading his sign out loud. A young girl named Livia also read her sign, saying she was inspired by one of the former first lady's speeches. "It says hope is all that matters. My mom told us to watch Michelle Obama's speech in the car on the way, and so she was talking about hope, so I decided to make it," said Livia. It was not only women’s rights the crowd marched for. “It’s really important for me personally as a queer Muslim," said Clover Steelman, who attended the march. The energy filled the thousands as the crowd made their way back to the Capitol. "I was down here marching in the 80s for MLK Day, and we’re still doing it--very surprising," said David Moxley, who attended the march. City officials tweeted that organizers of the Women's March on Washington had increased the expected turnout there to 500,000, up from 200,000, as crowds began swelling well ahead of the event's start and subways into the city became clogged with participants. It wasn't just a Washington phenomenon and it wasn't just women: More than 600 "sister marches" were planned across the country and around the world, and plenty of men were part of the tableau. In Washington, Rena Wilson, of Charlotte, North Carolina, said she hopes the women can send Trump a message that they're "not going anywhere." Joy Rodriguez, of Miami, arrived with her husband, William, and their two daughters, ages 12 and 10. "I want to make sure their rights are not infringed on in these years coming up," Joy Rodriguez said. "In the spirit of democracy and honoring the champions of human rights, dignity and justice who have come before us, we join in diversity to show our presence in numbers too great to ignore," their mission statement says. Retired teacher Linda Lastella, 69, who came from Metuchen, New Jersey, said she had never marched before but felt the need to speak out when "many nations are experiencing this same kind of pullback and hateful, hateful attitudes." "It just seemed like we needed to make a very firm stand of where we were," she said. Many arrived wearing hand-knit pointy-eared "pussyhats" -- a message of female empowerment aimed squarely at Trump's demeaning comments about women. The march attracted significant support from celebrities. America Ferrara led the artists' contingent, and those scheduled to speak in Washington included Scarlett Johansson, Ashley Judd, Melissa Harris-Perry and Michael Moore. The promised performance lineup included Janelle Monae, Maxwell, Samantha Ronson, the Indigo Girls and Mary Chapin Carpenter. Cher, Katy Perry and Julianne Moore all were expected to attend. Women and other groups were demonstrating across the nation and as far abroad as Myanmar and Australia. In Prague, hundreds gathered in Wenceslas Square in freezing weather, waving portraits of Trump and Russia's Vladimir Putin and holding banners that read "This is just the beginning," "Kindness" and "Love." "We are worried about the way some politicians talk, especially during the American elections," said organizer Johanna Nejedlova. In Copenhagen, march organizer Lesley-Ann Brown said: "Nationalist, racist and misogynistic trends are growing worldwide and threaten the most marginalized groups in our societies including women, people of color, immigrants, Muslims, the LGBT community and people with disabilities." In Sydney, thousands of Australians marched in solidarity in Hyde Park. One organizer said hatred, bigotry and racism are not only America's problems. Friday's unrest during the inauguration led police to use pepper spray and stun grenades to prevent the chaos from spilling into Trump's formal procession and the evening balls. About a mile from the National Mall, police gave chase to a group of about 100 protesters who smashed the windows of downtown businesses, including a Starbucks, a Bank of America and a McDonald's, as they denounced capitalism and Trump. The confrontation began an hour before Trump took the oath of office and escalated several hours later as the crowd of protesters swelled to more than 1,000, some wearing gas masks and with arms chained together inside PVC pipe. As night fell, protesters set a bonfire blocks from the White House and frightened well-dressed Trump supporters as they headed for the inaugural balls. Police briefly ordered ball guests to remain inside their hotel as they worked to contain advancing protesters.